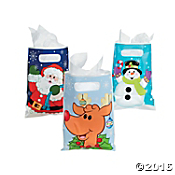 Treat bags are always a huge hit with my children's friends at school but they are so costly. Oriental Trading makes purchasing in bulk for parties and classrooms easy and affordable. They have every theme and holiday you can imagine covered. They have such a huge selection that you can find everything you need in one place from candy, toys, teachers gifts, bags and more. Oriental Trading is sure to have the perfect gift, décor or stocking stuffers. Check out their Christmas Holiday selection here. This was the gift bags my kids gave out at school this year. I have two children in school which means over sixty children. The Christmas Party Favor Bags were $7.49 for 36 so I got two of those which left over just enough to make bags for the school and the kids in the family. I always love the sticky hands. They always have them in holiday themes like pumpkins, hearts and bunnies. This year I got the Mitten Sticky Hands; they come with 72 pieces and were only $8.49. They also have glitter in them. 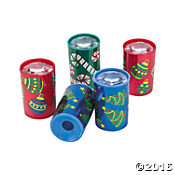 The kids love these they are inexpensive and make the children so happy. The next favor I love including are the prisms. The Mini Holiday Prisms are so unique. Oriental also usually has these in all the holiday designs as well. They include 48 pieces so I get two sets. They are priced at $7.49. These are fun for the kids and super cheap. I am never the favorite mom but I think the kids get a kick out of the putty. 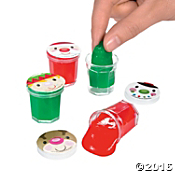 We got the Snowman Putty this year but it is no longer in stock; so check out the Cheery Christmas Mini Putty. It is only $9.99 for 48 pieces so for my children's classes I bought two. These are so cool! I also included the mini candy canes and the snowman marshmallows because you get a bunch of each for very little money. I love the marshmallow they come in individual serving packs and go great in hot cocoa. I also got my daughter the duckies. They are really cheap and they have so many different varieties of ducks. I love them! The boys I purchased some of the wipe of pads to add as stocking stuffers. They can write little messages and practice their ABC'S and do not tear up easily.